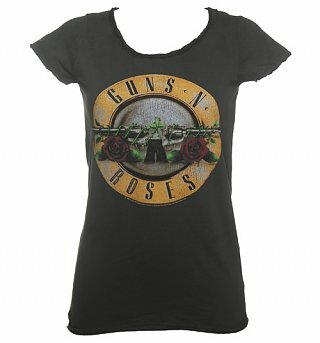 Customer Reviews of "Women's Classic Guns N Roses Drum T-Shirt from Amplified"
material is super soft and the shirt has a good length, covers bottom. The print looks a bit cheap in real life. Order was exactly what i had ordered. It came nice and quick. Website was easy to order off of. I would definitely use Truffleshuffle.com again. I bought two of these t-shirts, one for me and one for a friends, I was very pleased with the quality of the t-shirt and even now after it has been washed several times, it has kept its shape very well (unlike t-shirts I have bought from other websites). I am usually inbetween sizes, so I went for the bigger size, if this is the case then I would recommend getting the smaller size, as the t-shirt is slightly bigger than expected. It arrived on time, even though I ordered it just before christmas.